Two games in a row ended in similar fashion this week against the Pirates. The Cardinals failed to lead the Pirates prior to the 7th inning and also forced extra innings in both matchups. Late offensive success, and exploitation of the Pirates bullpen lead to two extra inning victories. There is a concern with the number of strikeouts, but also lack of productivity from the starting rotation, and homers surrendered. While the Cardinals may have escaped with wins, these were hard fought games with odd twists and turns. Yadier Molina his first appearance at third base in extra innings Monday in a game that featured nearly the entire team minus Ales Reyes. That isn’t the way to attack an 11 inning game, but the late ejection of Matt Carpenter forced the strange situation. Also troubling is the unusually slow start some of our veteran batters are displaying. Martinez, Fowler, Molina, and Carpenter have sub .200 batting averages. Paul Goldschmidt surprisingly leads the team in strikeout percentage at 37.5%, and Kolten Wong leads the team in slugging percentage. Not really the things anyone would have expected. Six games in we are playing .500 baseball. It is too early to really tell what is going to happen this season. Kolten Wong has been off to a hot start but we cannot expect that he will carry to offense through the season alone with Goldschmidt. And with six of the next twenty games being against the Brewers, we cannot continue to fight for wins the way we did against the Pirates. Late innings against Milwaukee will feature Josh Hader, and we are not likely show the late inning magic versus him. Marcell Ozuna has to this point not lived up to the hype and expectations that existed when the Cardinals traded for him last off season. Falling short in an attempt to bring Giancarlo Stanton to St. Louis, Marcell Ozuna became the biggest free agent acquisition from last year. After delivering 37 home runs in the 2017 season, Ozuna looked to be the middle of the order at bat the Front Office had been searching for. One season and a handful of games later we are still waiting for something exciting to happen. Ozuna was scratched from game two in Pittsburgh with “right side tightness.” The current situation is that we don’t really know how badly he is injured. He is scheduled to have an MRI on the Cardinals off day Thursday. His offense is not the only thing lacking, his defense almost looks to be in worse shape. The right-side tightness may be an indication that his shoulder is not as healthy as we were told. Just by watching, many fans have noted that the Pirates and Brewers were willing to test Ozuna’s arm. Sadly, they were easily able to beat his throws that landed far short and off line, and slowly dribbled into the infielders. We may never get the Ozuna that we had seen highlights of from 2016-2017. Recently on twitter, my attention was caught by @STLMattinals when he shared a video of a younger healthier Ozuna. It is fairly disturbing the level to which his arm has fallen to. His “gold glove” caliber defense has seemingly evaporated. see the comparisons below. Its not hard to see that something has changed, Ozuna is not healthy. An uncomfortable feeling sets in when seeing fielding balls hit in his direction. When the game is on the line and this is the throw you make, it’s simply unacceptable. It might be time to consider a more serious surgery and an extended IL stint. Doing so would open doors for O’Neil and Martinez to play more often. Possibly we could have a healthy Ozuna for an August-September push. Jedd Gyorko is nearing a return to the Cardinals 25-man roster. The question is who is moving to clear space for him? It’s possible that Ozuna will switch places with Gyorko and go to the IL. The cardinals light use of Drew Robinson may also be an indication that Gyorko will replace him as well. Either way, it may be nice to have some of Gyorkos offense during upcoming games. The Bullpen has had decent success thus far and has overall performed much better than the 2018 pen. Rising stars Gant, Brebbia, and Mayers have seen shared playing time and performed well. Dominic Leone has also pitched well in his opportunities and shows signs that he is healthy and competitive. Reyes and Miller haven’t been as sharp as expected. Both players are coming off of injury, so it may take them time to get comfortable and delivering consistently. The Cardinals are still only carrying one lefty (Miller) on the roster. So far it doesn’t look to have affected their success. One question is, would Dallas Keuchel have given you a better chance against the Brewers lineup? While that’s impossible to tell, many fans believe it would be a great addition to the rotation. Given early struggles, and fans seem to be unsure of Wainwright, Mikolas, Wacha, Hudson, and Flaherty. While it’s unlikely that the Cardinals sign any help, we will have to hope that some of these loose pieces continue to fall into place. Cardinal fans can look forward to the upcoming series and home opener at Busch Stadium beginning this Friday. Opening day festivities have been pushed back due to weather concerns. Goldschmidt is expected to make a grand Cardinals debut, and all living Cardinal Hall of Famers are expected to be present Fridays events. 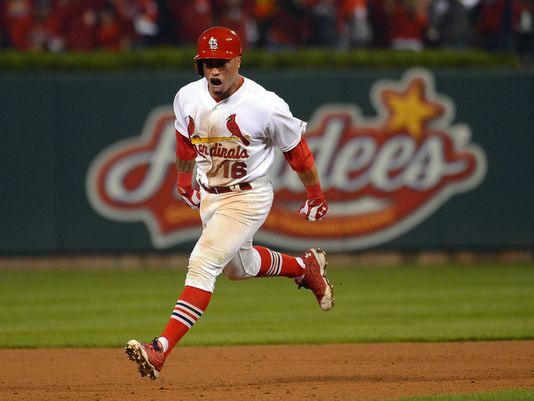 Aledmys Diaz to Toronto for Who?